This adjustable low profile, cam action clamp provides clamping of different size workpieces merely by rotating the clamp to one of its other edges. The clamps are .394 (10mm) high and use a 1/2-13 (M12) cam screw. Each of the six clamping surfaces is a different distance from the centerline by .0394 (1mm) as shown in the chart. Therefore, one Series-9 Clamp can hold parts that vary up to .240 (9.4mm) simply by rotating the clamp to a different clamping surface. #90115 Series-9 Clamp, 1 to 6 Serrated, 1/2-13. 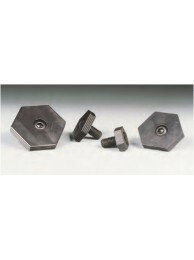 ​Typically ships in 3-5 days, for current lead time,..
#95115 Series-9 Clamp, 1 to 6 Serrated, M12. Typically ships in 3-5 days, for current lead time, ple..
#90110 Series-9 Clamp, 1 to 6 Smooth, 1/2-13. Typically ships in 3-5 days, for current lead time, pl..
#95110 Series-9 Clamp, 1 to 6 Smooth, M12. Typically ships in 3-5 days, for current lead time, pleas..
#90135 Series-9 Clamp, 13 to 18 Serrated, 1/2-13. Typically ships in 3-5 days, for current..
#95135 Series-9 Clamp, 13 to 18 Serrated, M12. Typically ships in 3-5 days, for curr..
#90130 Series-9 Clamp, 13 to 18 Smooth, 1/2-13. Typically ships in 3-5 days, for current l..
#95130 Series-9 Clamp, 13 to 18 Smooth, M12. Typically ships in 3-5 days, for current lead..
#90145 Series-9 Clamp, 19 to 24 Serrated, 1/2-13. Typically ships in 3-5 days, for cu..
#95145 Series-9 Clamp, 19 to 24 Serrated, M12. Typically ships in 3-5 days, for curre..
#90140 Series-9 Clamp, 19 to 24 Smooth, 1/2-13. Typically ships in 3-5 days, for curr..
#95140 Series-9 Clamp, 19 to 24 Smooth, M12. Typically ships in 3-5 days, for c..
#90125 Series-9 Clamp, 7 to 12 Serrated, 1/2-13. Typically ships in 3-5 days, for current ..
#95125 Series-9 Clamp, 7 to 12 Serrated, M12. Typically ships in 3-5 days, for curre..
#90120 Series-9 Clamp, 7 to 12 Smooth, 1/2-13. Typically ships in 3-5 days, for current le..
#95120 Series-9 Clamp, 7 to 12 Smooth, M12. Typically ships in 3-5 days, for current lead ..